Use a soft sponge or cloth that won't scratch your stainless steel. 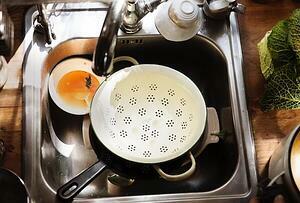 Avoid acidic cleaners to protect your stainless steel against rust. Stick with tried and true cleaners such as club soda, white vinegar mixed with olive oil, WD-40, glass cleaner (for fingerprints), dish soap mixed with baby or mineral oil, a cleaner designed specifically for stainless steel, or just plain water works, too! As for other appliances such as your outdoor refrigerator, sort through leftover food items weekly. The last thing you need is to forget about a steak you left marinating in there for a month and a half. Out of all of the areas in your kitchen, your countertops should be the cleanest. Ironically, though, these are the areas that get dirty the fastest. Countertops should be wiped down before meal prep, during meal prep, and after a meal is served. Depending on the material your countertop is made of, you may use it as a cutting board. In that case, it is even more important to stay vigilant about keeping the surface sanitary. To protect against cross contamination, do your best to handle raw meats on one dedicated section of your counter, and prepare veggies, breads, and dairy elsewhere. Got granite countertops? Follow these instructions on caring for granite. Empty charcoal remains (if using a charcoal grill). Wipe grease from the inside lid and other interior pieces of your grill. Remove heat plates and wash them with warm soapy water. Empty the grease cup and unclog it if necessary. For safety, wait until your fireplace or pizza oven is completely cool. If you spill or drop food in the oven, clean it up as soon as possible to keep it from cooking down. Invest in a quality pizza oven brush or scraper and use it each time you cook food in your oven. Research the material that your oven or fireplace is made of before applying any cleaners. Warm soapy water works just fine to wipe down most types of outdoor furniture. If you have pillows or cushions on your patio furniture, be sure to remove them before it rains and wash them as often as necessary. We hope this checklist has been helpful as you maintain your beautiful outdoor kitchen. Please let us know if there is anything we can do design-wise to take your kitchen to the next level!